When we think of failure, we naturally think of something messy, expensive, uncertain and undesirable. Particularly in the context of business, we often view failure as the worst possible thing that could happen. No one wants their business to go under, their life’s work to be unsuccessful, or have employees that are not living up to expectations. While this is perfectly logical, consider how allowing the freedom to fail prevents those actual failures from happening. Keep in mind, this type of freedom does not condone poor performance or celebrate mediocrity. When applied to how we solve problems, it allows us to strive for innovation, encourage personal growth, foster collaboration, build mutual trust, and focus on what matters. Every time we fail, we have the opportunity to invent new solutions to problems. When you realize what doesn’t work, you get closer to what does. And, these new solutions are often more elegant and creative than we could have initially imagined. Allowing an employee to try new solutions to solve a problem gives them a broader depth of experience – experience they would not have gained without failure. This breeds perseverance, confidence, and determination with each new attempt. When we don’t have the answers right away, it forces us to look to others to gain better understanding. After an unsuccessful attempt, it causes us to ask more questions or seek out a different perspective from our teammates. Getting critical feedback can lead us to think about something in a way we hadn’t considered before. When managers allow for failure, we are placing our trust directly on our employee’s shoulders. This not only instills confidence, but allows the employee to take ownership of the process. The employee aims to live up to the trust placed in them and, in turn, they trust their manager more for giving them the latitude to take risks. If an employee’s main concern is to never mess up, they will only ever meet the status quo. They aren’t going to be looking for ways to make improvements or take any risks. This might provide you with a hive full of worker bees, but no real visionaries to move your business forward. It is far more rewarding to have spectacular failures trying to achieving an ambitious goal than have safe successes achieving an inconsequential one. 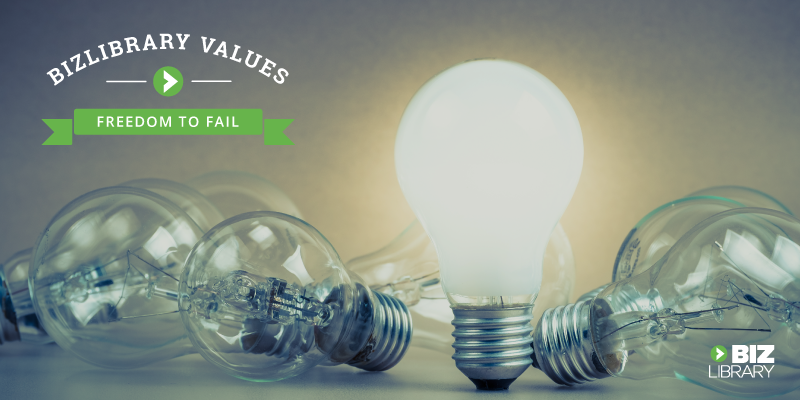 While encouraging failure seems counter-intuitive, giving ourselves and others the freedom to take chances and learn from our mistakes is essential to both personal and organizational success.